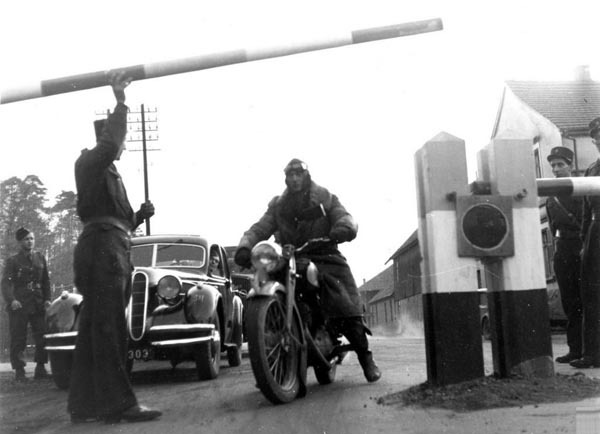 After the Second World War, as national boundaries were restored in Europe, customs posts sprung up at the borders (like the one illustrated at Saarbrücken, between France and Germany). Tariffs were levied on much of the cross-border trade. Then in 1957, for the Six, along came the EEC. Its founding document, the Treaty of Rome, established the mechanisms to create a customs union. This was to abolish tariffs at internal borders and set a common external tariff, where goods coming into the Community all attracted the same rate of duty. The customs union was complete by 1968, two years ahead of schedule. But that did not mean the abolition of customs controls – not by any means. Last year a Belgian journalist rented a van and loaded it up with some old furniture that he wanted to take to a holiday house that he had just bought in the South of France. He drove to the frontier and was eventually allowed to cross an hour and a half, 15 signatures and half-a-dozen forms later. The import of second-hand furniture into France for a holiday home ('Do you have proof of ownership, sir?') is perfectly legal, and not subject to any tax or duty. But all the old French customs procedures still exist. The red tape involved in transporting an old wardrobe is the same as for a load of computers or fifty barrels of poisonous dioxin waste from Seveso. Customs formalities were taking an average of 80 minutes per lorry. Each hour's delay cost between £2.50 and £3.25. The overall cost of customs controls was therefore in the region of £1.7 billion (at 1980 prices) – between 5-10 percent of the value of the goods transported across frontiers. In the February that year, a go-slow by customs officials on the Franco-Italian border brought the system to crisis point, when French lorry drivers mounted a strike in protest, blockading roads and paralysing commerce. After two weeks, riot police and soldiers had to be mobilised to clear the roads. At Community level, the response in June 1984 was for the Fontainebleau European Council to agree in principle to abolish customs and police formalities at the Community's internal borders. On 13 July 1984, the French and German governments took the step towards attaining this objective, signing the Saarbrücken Agreement at the Saarbrücken-Forbach border crossing point in symbolic Goldene-Bremm area. This bilateral treaty – completely outside the framework of the Treaty of Rome and its customs union - committed the two nations to reducing checks and establishing joint control points. The following year, on 14 June 1985: Belgium Luxembourg and the Netherlands joined with France and Germany to build on this initiative, signing the Schengen Agreement. The five countries committed themselves to the gradual abolition of checks at shared borders and to facilitate the transport and movement of goods at those borders. The theme was further developed in the White Paper on the completion of the internal market, also published on 14 June 1985, when complete abolition of frontiers was proposed. This was adopted in the Single European Act on 9 September 1985. Article 13 added measures to establish the internal market - "an area without internal frontiers in which the free movement of goods, persons, services and capital is ensured in accordance with the provisions of this Treaty". With the target of eliminating internal frontiers by 1992, in the interim, exit checks at Community internal frontiers were to be abolished when goods were transported between two Member States. Formalities were to be confined to the office at the point of entry, avoiding much of the duplication and delays that were still occurring. Amongst other things, this report furnishes evidence that border controls were still an issue in the late 1980s, 30 years after the signing of the Treaty of Rome. It also demonstrates that the abolition of frontier controls came with the creation of the internal market, rather than with the customs union. Despite this, if we fast forward to April of this year and we can see the Treasury Report which assessed the impact of leaving the EU. Amazingly, this report asserted that the Single Market had created a customs union within the EU – a gross historical inaccuracy, then wrongly claiming that the customs union, "means that there are no customs checks on trade within the EU". Not content with just these errors, the Treasury went on to assert that: "a common external trade policy is an inherent and inseparable part of a customs union", allowing the false claim that membership of the EU's custom union would prevent the UK making its own trade deals. Post-referendum, these errors were repeated by the Financial Times on 26 July, creating a narrative which supposedly revealed internal conflict in the heart of government. It had Dr Fox, the current international trade secretary, wanting to pull out of the customs union, to give him "maximum freedom to negotiate new trade deals around the world", while the Treasury wanted to stay in, to avoid businesses being faced with customs controls and mandatory paperwork when exporting to the EU. Such conflict is loved by the media, which has picked up the false narrative and run with it to this day, with not even a hint of critical analysis or any attempt to check the veracity of the claims. Thus, we have produced Monograph 16 on leaving the customs union. And what emerges from this is that the conflict is not real. The restriction on negotiating trade deals stems not from the customs union but from the EU's common commercial policy and its exclusive competence over international trade agreements. On the other hand, while the removal of physical barriers to the free movement of goods within the Community is an adjunct to the customs union, it is not dependent on it. The abolition of frontiers came with the Single European Act in pursuit of developing the internal market, so the customs union is an irrelevance in this respect. To that extent, the customs union issue, and Britain's membership of it, is a red herring. The media conflict is spurious and has nothing to do with the substantive issues relating to Brexit. The question of membership should never have arisen. It should be a given that we leave the customs union when we leave the EU. However, it seems that the capacity of the media to chase down red herrings is unlimited. But this one really should be given a decent burial.